When I was in Bristol this weekend just gone it was inevitable that I'd end up in Cabot's Circus, circling the beauty hall of House of Fraser for exciting products I'd yet to discover, and also meandering up to Park Street to comb though the shelves of the stand alone Space NK that sits on the corner of the street. While I did manage to come home with a few goodies (what girl wouldn't!) I came away with a longer wish list. I love Bristol for shopping, it has all the big name brands I love, and more. So what's on my wish list now? First up is Clarins One Step Gentle Exfoliating Cleanser, a product that I actually managed to use as I found a small sample in J's Aunty's shower. It was such a lovely little cleanser, the microbeads weren't overly harsh and it left my skin feeling so soft and lovely. I'm definitely after the full sized product now! Next is something else I tried, Jo Malone's Peony & Blush Suede Cologne. Harvey Nichols in Cabot's Circus boasts a rather large Jo Malone concession, and, having never tried the brand before I went in for a sniff. Before I knew it I was being treated to a consultation about fragrance combining and having the most luxurious body creme applied by the sales consultant. This fragrance really stood out to me as it's floral, and I don't have any floral fragrances - yummy! I spied this new L'Oreal Sublime Bronze Tanning Elixir in the sun aisle of Tesco yesterday and looked at it with wonder. I've been partial to a bit of self tan over the years and this one promises to gradually bring out the tan over two weeks, I'd love to try this one. And it comes in a glass bottle, how fancy. I'm currently searching to the right kind of face base to take to St Lucia with me in September, I want it to have a good SPF and not be drying on my skin, two factors that Origins A Perfect World BB Cream has. I've always has good results with Origins products with all that I've used so far so I have high hopes for this one. Again another product I tried because J's Aunty has it, Bobbi Brown's Face Base. It's a luxurious moisturiser primer and felt incredible on my skin. I can't say I noticed a visible difference in the longevity of my makeup as I only tried a little bit once so I'd love to give this a go properly. Clinique's Moisture Surge Extended Thirst Relief Moisturiser (wow, what a long name!) was mentioned by Zoella in one of her recent videos as her go to product to take onboard a long haul flight. As a girl with really dry skin i'm constantly on the lookout for new moisturisers to combat my dry patches and this one sounds really promising, desperate to get my hands on this! My finally thing on my wish list is this gorgeous Rosa Mundi candle by Diptyque. I recently finished my Baies mini candle and found myself rationing it towards the end as I loved it so much. I had a quick sniff of this in Space NK and instantly fell in love, it smells divine. So that's my current wish list, seen anything that takes your fancy? I would love a Jo Malone perfume. So expensive though! I've dared to buy the little Jo Malone bottles, but I'm yet to splash out on a giant one! So expensive! 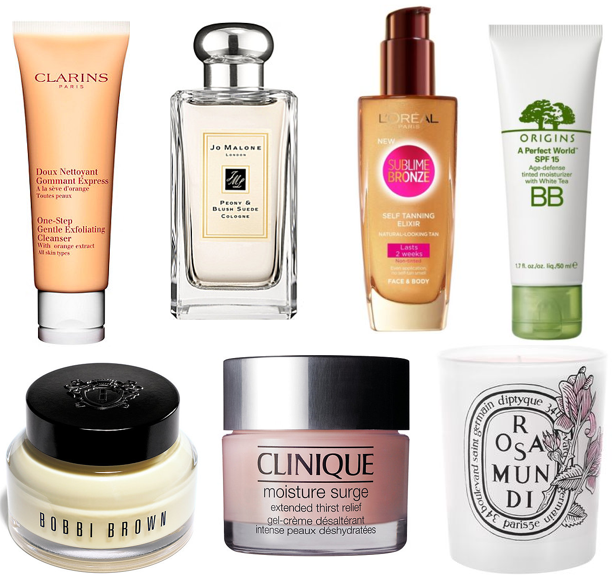 Loved this post, I really want to try out Origins and Bobbi Brown.